Sisko’s friend Prylar Eivos dies, leading to problems between him and Kasidy. NOTE: This story dramatises events first described in the licensed Star Trek novel Rough Beasts of Empire, written by David R George III. I also owe thanks to TrekBBS.com member DerangedNasat for his work on translating the Bajoran language, some of which I used in this story. Kira has brought a broken girl to DS9. Can Kira help or make it worse! 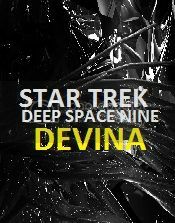 In 1993 I wrote two scripts for STAR TREK DEEP SPACE NINE. One of them was Blood Island, the other was this story, Davina. It takes place during the first season of the show, when we were just getting to know the characters. I have converted it to story form and I hope you enjoy it. When I wrote this script it was my second attempt and it was fun. All I have to show for it is the stamp on the first page and the log code they gave it. Years later, a friend and I collaborated on a script for The Dead Zone and that one actually got bought. They never used it because the show got axed. But wow, what a thrill it was when we got that acceptence letter. I don't think any shows allow outside writers anymore, which is too bad. Summary: The Prophets warned that he would know only sorrow. Now is the time for a joyful miracle. Summary: Through the looking glass, Miles O'Brien makes the acquaintance of two Julian Bashirs. He's always had a talent for fixing broken things. This is the tale of how darkness fell over the Mirror Universe, as remembered by one who is of the Prophets, in the presence of a very different Dukat who is of neither his universe nor the Mirror.